On this 8-day itinerary you will see the very best wildlife that the Argentinian Atlantic Coast has to offer. The accommodation is a mix of a traditional estancia, a restored lighthouse and a beachside hotel. You will have the freedom and flexibility of your own wheels to explore the areas at your own leisure. Transfer from the airport at Trelew towards the Vales Peninsula. The route will take you through the dry, almost desert-like scrubland of the Patagonia plains, on to the peninsula. Few places in the world offer the possibility to observe so many animals in their natural environment. 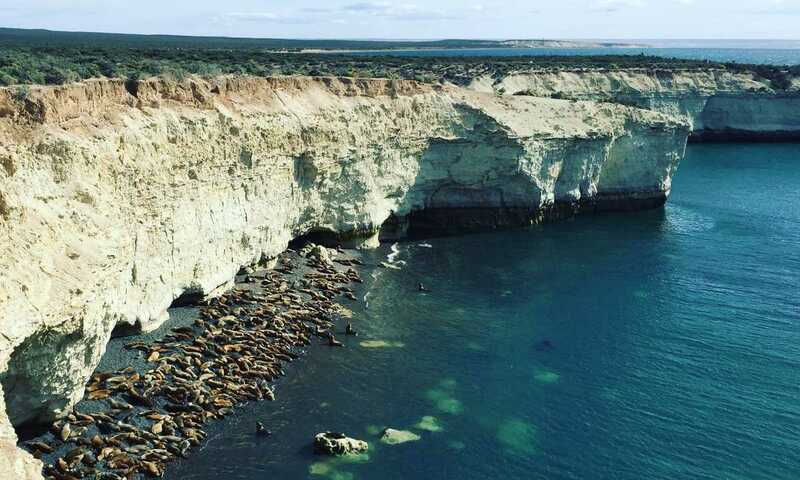 Giant whales, sea lions, elephant seals, penguins, numerous birds, guanacos and other terrestrial species are concentrated in this Nature Reserve of 360 hectares. The first night's accommodation is the Hotel Peninsula Valdes, a comfortable, contemporary sea-front base in the heart of the town. Appreciate panoramic views of the Golfo Neuvo from the hotel, and unwind and renergise from the travels in the spa and gym. Begin the day exploring the north of the Valdes Peninsula, with visits to San Lorenzo and Punta Norte. The trail at San Lorenzo gives you plenty of opportunities to watch the prancing, discussions and disputes of the penguins which inhabit the area's largest Magellan penguin colony. You will also see Guanacos, Maras (Patagonia hares) and Rheas. Then continue along the coast to the Punta Norte Wildlife reserve, famous as the site where orca/killer whales have developed an extraordinary hunting technique for ambushing sea lion pups at high tide, momentarily beaching themselves in the process. Into the afternoon, you'll drive south along the coast past Caleta Valdes to see more wildlife, ending up at Punta Delgada, on the Golfo Nuevo, where you can find the largest colony of elephant seals on the peninsula. The night will be spent at the iconic Fara Punta Delgada, a former naval lighthouse which now operates as a luxury lodge and restaurant. The drive to Punta Delgada is 66km - just under 2 hours drive. The hotel is home to it's own Elephant Seal colony which is not to be missed if you're staying between late June-September. Spend the morning getting up close with these giants of the sea, and take the opportunity to see the diversity of marine life to be discovered at the beaches of Punta Delgado (year-round). You can also choose an excursion offered from Punta Delgada. The hotel guides will assist you in arranging options such as guided treks in the surrounding area and horse riding through the cliffs. In the afternoon you'll be able to pick up your rental car from the hotel, ready to drive the 2.5 hours to Puerto Madryn. Stretch your legs from the drive with a walk along the sandy coast alongside penguins and whales, and then soak up the welcoming atmosphere at the port by evening. Escape further and further into the wilderness as you drive the five hours from Puerto Madryn to Bahia Bustamante. Here, enjoy total remoteness and relaxation, savouring history as you roam around petrified forests, and discovering diverse marine life on endlessly long beaches. The afternoon is free for you to become acquainted with the entirely unique landscape and atmosphere in which the lodge is set. Welcoming guides will help you to choose an excursion which most suits your preference. 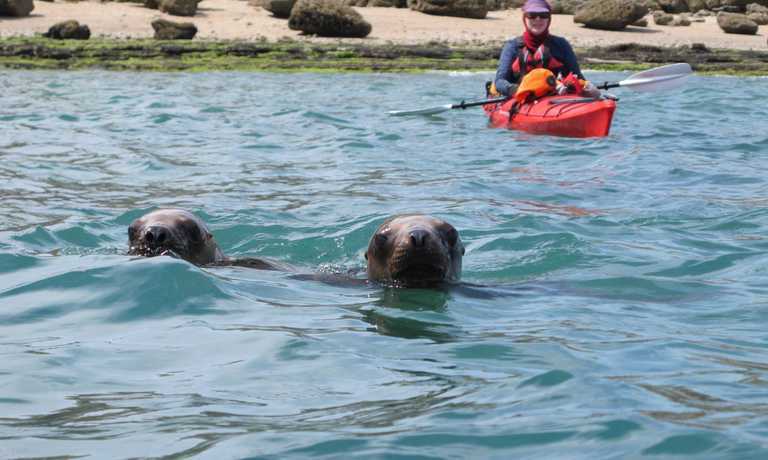 Options include: guided walks to the penguin and sea lion colonies; sailing trips over the Calera Malaspina; kayaking trips in the wild nature of the Cape Aristizabal, Caleta Malaspina and Gravigna Peninsula; and even visits to seaweed harvesting sites where you can learn about harvesting methods and the use of different species of local algae. Available excursions are decided on a day-to-day basis, taking into account the tide and the weather conditions. Wake up to stunning panoramic views and blissful solitude, before a delicious buffet style breakfast of pastries, cereals, fruits and breads. You'll have the full day to embrace the excursion/s of your choice. In addition to the options described above, a range of other opportunities will allow you to explore the Gravina Peninsula and neighbouring coasts by foot, bicycle, in a 4WD, and on horseback. During your excursions you can reach coastal buoys and indigenous sites of the Chenques and Picaderos. At low tide deep natural pools, ideal for bathing in summer, are formed, and you can also cross to an island (by foot) which is home to a colony of Magellan Penguins. 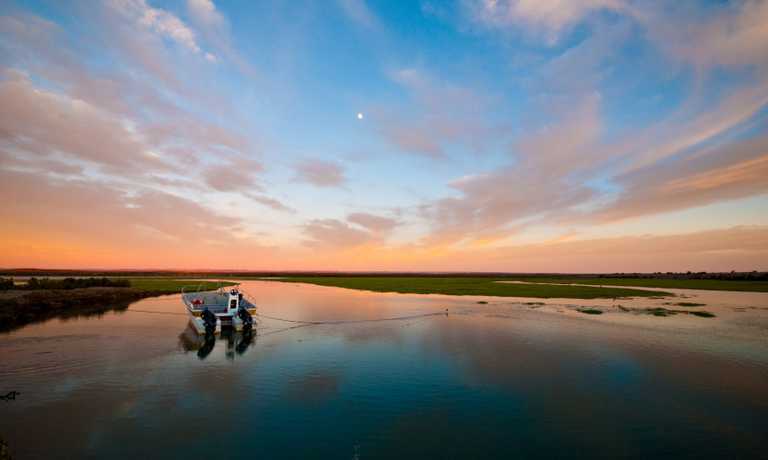 Set off on a journey through the country to Puerto Deseado, a fishing port in the Santa Cruz Province, on the estuary of the Deseado River. The drive will take approximately 7 hours, presenting various sights and sounds of the immensely blue ocean, golden cliffs, and soaring birds. 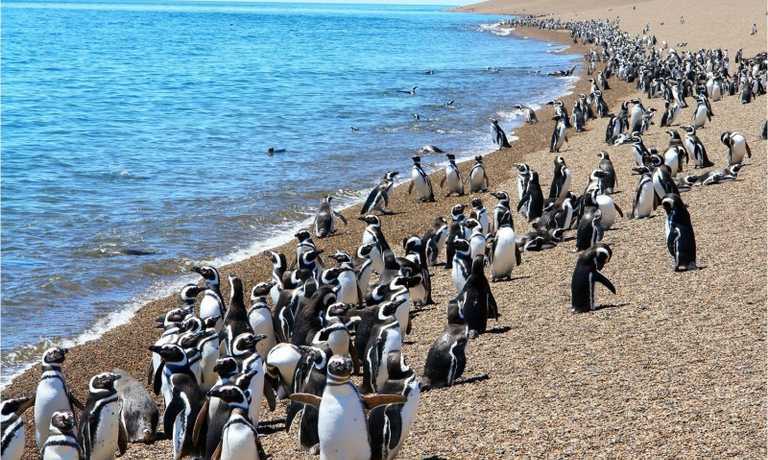 Puerto Deseado is a real paradise for fauna lovers: thousands of penguins (three kinds), sea elephants, dolphins, and all kinds of sea birds can be observed here. Explore the area after the drive, in anticipation of a day of even more wildlife spotting tomorrow. Today's boat trip will take you out of the Inlet to Isla Pinguino (Penguin Island), where you will meet Rockhopper and Magellanic Penguins, skuas, Upland geese and shorebirds. You may also see feeding sea birds and dolphins when sailing out to the island or returning to the mainland. The Southern Rockhopper penguin is the smallest of the crested penguins; watch them jump out of the sea and hop from rock to rock at a very close distance. There is a chance that you'll see Commerson's dolphins, and if the wind catches up Black-browed albatrosses will fly close to you. The views of the coast will be recognised by those who are familiar with Conrad Martin's illustrations of Darwin's voyage. Drive to Comodora Rivadavia (approximately 3.5 hours), then fly to Buenos Aires in the afternoon, ready for your home or onward travel. Departures can be set up on a date of your choice, subject to availability. Please enquire for more details. This trip can run as a group trip, with prices starting from $2,995 per person for a complete group. If you are looking to join a group or you are a solo traveller we will help to form likeminded groups of travellers. Please let us know your travel plans.